Carolyn Bishop was born in Toronto Canada. Carolyn received her education in California and started her career in education as a sixth grade teacher. Her post baccalaureate education focused on curriculum, staff development, cognition, educational administration and online learning and thinking. Carolyn Bishop is serving the Biola students as the Director of Elementary Education implementing her knowledge of quality teacher preparation and technology in the process of educating future teachers to serve in all parts of the world. 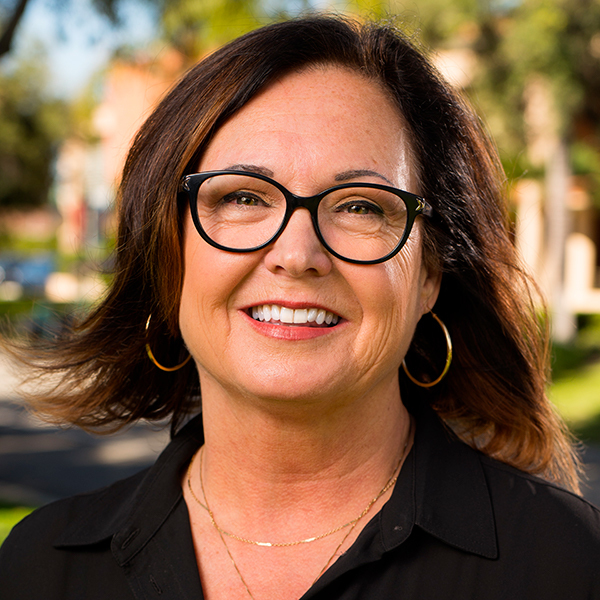 It is her desire to ensure high quality educators are in all classrooms and that the integration of faith is an integral part of each student's experience here at Biola University. Dr. Bishop's research agenda has been around teacher preparation, program design, environmental impacts of online education, and online thinking and learning. Her current research project is regarding teacher dispositions and how best to shape the practices of teachers to positively impact student learning. She has published articles on online thinking and learning and quality teacher preparation. "Increasing Student Interaction Online: A Review of the Literature in Teacher Education Programs" (2012). Journal of Technology and Teacher Education. "Thinking Styles: Maximizing Online Supported Learning" (2011). Journal of Educational Computing Research, 44(2), 121-139. "Alternative Certification: Effectively Preparing Teachers "(2008). The Journal of the National Association for Alternative Certification, 3(2), 8-2. "Profiles of Potentially Successful On-Line Learners in a Teacher Credential Program" (Doctoral Dissertation, California University Irvine and California University Los Angeles, 2008). "Motivation and Learning Styles: How do We Learn?" Professional Development Day, Spirit Academy, Tustin, CA, January 2012 and March 2012. "Building Community: Effective Strategies to Increase Interaction in Online Learning." SITE 2012--Society for Information Technology & Teacher Education International Conference, Austin, Texas, USA, March 2012. "Understanding Thinking and Learning: How do You Learn?" Road to Teaching Conference, Santa Ana College, Santa Ana, CA, November 2011. "The Development of Teacher Candidate Dispositions. "California Council on Teacher Education, San Diego, California, October 2011. "Education and Technology: Session II." Lebanon Conference II: Educational Challenges and Today’s Classroom, Beirut, Lebanon, September 7, 2011. "Education and Technology: Session I." Lebanon Conference II: Educational Challenges and Today’s Classroom, Beirut, Lebanon, September 7, 2011. "Policy and Research General Session: Panel of State Agency Administrators." National Association for Alternative Certification, 21st Annual Conference, Las Vegas, Nevada, March 2011. "Putting Technology in the Hands of Children." California League of Middle Schools Conference, Monterey, CA, January 2011. "Putting Technology in the Hands of Children." National Association for Alternative Certification, 21st Annual Conference, Las Vegas, Nevada, March 2010. "Alternative Certification: An Effective Model of Online Supported Teacher Education." SITE 2010--Society for Information Technology & Teacher Education International Conference, San Diego, CA, March 2010. "Going Green: An Internet-Supported Program's Positive Effect on the Environment." National Association for Alternative Certification, 20th Annual Conference, Las Vegas, Nevada, January 2010. "Technology Use: Teacher Preparation and Candidate Outcomes. "California Council on Teacher Education, San Diego, California, October 2009. "Alternative Certification: An Effective Model of Online Supported Teacher Education." Society for Information Technology & Teacher Education, 20th International Conference, Charleston, South Carolina, March 2009. "Alternative Certification: Preparing High Quality Teachers Through an Online, Technology-Driven Program. "National Association for Alternative Certification, 19th Annual Conference, San Antonio, Texas, January 2009. "Effective Online Communication: Professionalism, Civility, and Clarity." National Association for Alternative Certification, 19th Annual Conference, San Antonio, Texas, January 2009. "Quality Matters in Innovations in Online Learning and Educational Technology for Teacher Education (Piloting a Standardized Teacher Performance Assessment in an Online Learning Environment)." American Association of Colleges of Teacher Education, Annual Conference, New Orleans, Louisiana, February 2008. "Alternative Certification: Preparing High Quality Teachers Through an Online, Technology-Driven Program. "National Association for Alternative Certification, 18th Annual Conference, Atlanta, Georgia, April 2008. "Higher Education Through Electronic Learning: Preparing High Quality Teachers Through an On-line Supported Program." Society for Information Technology & Teacher Education International Conference, Las Vegas, Nevada, March 2008. "Using a Teaching Performance Assessment System to Enhance Connections across the Learning to Teach Continuum. " California Commission on Teacher Credential Intern State Directors’ Conference, “Unlocking the Potential of Teaching and Learning,” Sacramento, California, November 2007. "Higher Education Through Electronic Learning: Preparing High Quality Teacher Through an On-line Supported Program." Association for the Advancement of Computing in Education, “World Conference on E-Learning in Corporate, Government, Healthcare, & Higher Education,” Quebec City, Quebec, Canada, October 2007. "The Effective use of Educational Media: Preparing High Quality Teachers Through an On-line Supported Program." Association for the Advancement of Computing in Education, “World Conference on Educational Multimedia, Hypermedia & Telecommunications,” Vancouver, British Columbia, Canada, June 2007. "Alternative Certification: Preparing High-Quality Teachers Through an Online-Supported Program." National Center For Alternative Certification / National Association For Alternative Certification Joint Conference: Alternate Routes: Building a Highly Qualified Teaching Force, Washington, DC, April 2007. "Online-supported Science Teacher Preparation; CalStateTEACH." National Science Teaching Association: National Conference on Science Education, “Science: A River of Connections, St. Louis, Missouri, March 2007. "Using the Clinical Supervision Protocol to Improve Student Outcomes." California Commission on Teacher Credential Intern State Directors’ Conference, “Learning to Teach: Bridging Professional Learning Communities,” Sacramento, California, November 2006. "Formative Assessment for Teacher Candidates: Using Taskstream’s Directed Response Folio." Pre-conference Workshop, American Association of Colleges of Teacher Education, Annual Conference, Chicago, Illinois, February 2004. "Working With Interns and Student Teachers: The Same But Different." Learning Support Faculty Conference, CSU Monterey Bay, Seaside, California, October 2002. "CalStateTEACH and the Star Teacher Selection Interview." National Association for Alternative Certification, Annual Conference, Chicago, Illinois, March 2006. "Intern Support and Assessment: Improving LSF/ASF Coaching and Supervision." Faculty Conference, CSU Monterey Bay, Seaside, California, October 2001. "How to Support Students with the Portfolio Process." Faculty Conference, CSU Monterey Bay, Seaside, California, October 2001. "What Support New Teachers Need for Success" California State University New Teacher Conference Newport Beach, California, May 1984.